It has been hard for Google to find the right balance on dealing with trademarks and their search ads. Can you bid on competitors trademarked names? 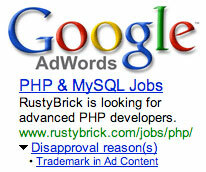 Can you use those trademarks in your ad copy? Google has updated their AdWords trademark policy to fit on standard worldwide, specifically with using the trademarked terms to trigger ads (not in ad copy). Effective April 23, 2013 Google "will not prevent use of trademarks as keywords in the affected regions, trademark owners will still be able to complain about the use of their trademark in ad text." Google said they will "will no longer prevent advertisers from selecting a third party's trademark as a keyword in ads targeting these regions." The regions Google disallowed this in the past were China, Hong Kong, Macau, Taiwan, Australia, New Zealand, South Korea, and Brazil. You can learn more about this change over here. But this basically simplifies, for Google, their policy on this matter.